" Estimated adequate nutrient concentrations of diets offered to captive animals are based on species' natural diets, gastrointestinal morphology and established nutrient requirements of similar species; h Nutrient intake calculated based on actual annual food consumption of three adult giant pandas and chemical analysis of those foods; intake of bamboo species based on equal distribution of actual bamboo intake over five commonly offered species; intake of bamboo components (leaf, branch, culm) based on prediction equations of the relationship between total bamboo fresh mass and bamboo component diy mass (Edwards et al., unpublished data); nd, nutrient concentrations not determined by chemical analysis; c Recommended nutrient allowances (4.0 kcal ME g-1) to support maintenance in adult dogs (NRC, 2004); d Minimum nutrient profiles for dog food (3.5 kcal ME g-1) to support maintenance in adult dogs (AAFCO, 2004); e Due to poor bioavailability, iron from carbonate or oxide sources that are added to the diet should not be considered in determining minimum nutrient concentration; ^ Due to poor bioavailability, copper from oxide sources that are added to the diet should not be considered in determining minimum nutrient concentration; g Although a true requirement for crude fat has not been established, the minimum concentration was based on the recognition of crude fat as a source of essential fatty acids and as a carrier of fat-soluble vitamins; h As feed manufacturing may destroy up to 90% of the thiamin in the diet, allowances in the formation of supplemental foods should be made to ensure that the minimum nutrient level is met after processing; ' Normal diets not containing raw egg white provide adequate biotin; administration of oral antibiotics may require supplementation. Schaller et al. (1985) reported that the giant panda excretes more water in its faeces than it obtains from food, except during seasons when high-moisture Fargesia shoots are consumed. Pandas compensate for this water deficit through consumption of wet bamboo during rainy periods and by drinking free water from depressions and pools at least once daily (Yong, 1981; Schaller et al., 1985). Approximations of free-water intake underestimate total water requirements because of omission of water in food and metabolic water (Robbins, 1993). An adult female giant panda (100 kg BW) consuming a daily average of 6.2 kg of bamboo (on a fresh-weight basis) would ingest 3.8 kg of preformed water associated with bamboo tissues (Phyllostachys aurea leaves contain 62% moisture). It is recommended that potable water be available ad libitum for captive animals. Excluding water, carbohydrates are the most abundant compounds in plants. As a storage form of photosynthetic energy, carbohydrates are quantitatively a significant source of food energy for herbivores (Van Soest, 1994). A diverse group, carbohydrates are classified according to chemical structure, which, in turn, influences how they are used by animals and how they are quantified analytically (NRC, 2003). Some carbohydrates (e.g. starch) are readily degraded by endogenous mammalian enzymes, such as salivary and pancreatic a-amylases. However, endogenous enzymes cannot degrade others, such as the structural carbohydrates cellulose and hemicellulose, where use depends on microbial fermentation by symbiotic gastrointestinal anaerobes yielding beneficial volatile fatty acids. Gastrointestinal adaptations which promote an environment conducive to this symbiotic relationship are pronounced in herbivores. However, as we have already indicated, these gastrointestinal adaptations for the giant panda appear to be limited only to an enlarged surface area of the colon with an absent fermentation compartment. Dietary fibre collectively includes those indigestible components that comprise the plant cell wall (NRC, 2003). Neutral detergent fibre (NDF) includes the total insoluble fibre in the plant cell wall, primarily cellulose, hemicelluloses and lignin. Acid detergent fibre (ADF) is primarily cellulose and lignin. Schaller (1993) described the limited digestive capacity of the giant panda by suggesting that much of what is eaten is useless bulk. Yet that fraction of the diet that is not digested, absorbed or metabolised may play an important role in maintaining gastrointestinal tract health. Although fibre is not generally considered a dietary essential for simple-stomached mammals, its benefits have been demonstrated for many species (NRC, 1985, 2003), including for herbivores (Edwards, 1995). Conversely, those species that are mostly herbivorous experience the most negative health and behavioural effects when dietary fibre is reduced or eliminated. Fibre concentrations in bamboos vary among species, plant parts (e.g. leaves, branches, culm), within species and across seasons (see Table 6.A.1 in Appendix 6.A). The ability of the giant panda to utilise various plant cell wall fractions is summarized in Table 6.3. Animals require protein and about ten constituent amino acids to support growth, maintenance of body tissues and other essential metabolic functions. Dietary protein requirements are not only influenced by life stage, metabolic disorders and environmental factors, but also by the digestibility and quality of the protein source. Protein quality is determined by the relationship between amino acid composition and the animal's amino acid requirements. Little research has been conducted to quantify protein or amino acid requirements for the giant panda at different life stages. Crude protein consumption by free-ranging giant pandas (based on observations of feeding behaviour) has been estimated to be 246.1 to 645.6 g per day by Schaller et al. (1985) and 145.3 to 664.5 g per day by Pan (1988). These observers concluded that protein concentrations consumed in the free-ranging panda diet were from 1.9 to 9.4% on a dry-matter basis. Based on this information, Schaller et al. (1985) and Pan (1988) calculated that the crude protein requirement of giant pandas is 100 g per day and 75.3 to 93.0 g per day for an 80-kg individual, respectively. This estimated requirement could also be expressed as 1.3 to 1.6% crude protein on a dry-matter basis. It is important to note here that one cannot assume that the intake of protein (or any other nutrient) by a free-ranging animal is representative of'what is required'. Such measures cannot be done accurately in the field, based solely on behavioural observations. Furthermore, a free-living animal may be consuming diets far above (or below) actual requirements, particularly in seasonal environments. It is likely that animals in the wild attempt to compensate over long time-frames to periods of shortage versus abundance by changing protein intake and lean body mass. And, when unable to do so during intervals of drought, harsh winters or even serious human disturbances, the animal may experience reproductive failure, increased disease susceptibility and mortality. Also, it may well be possible that extant wild panda populations are indeed feeding on diets that differ substantially from their ancestors. Human-induced habitat restrictions and alterations now prevent giant pandas from food resources normally found only at lower elevations. It is interesting that estimates ofcrude protein intake and protein required for animals under field conditions and for maintenance and growth of subadults are lower than anticipated based on known needs for other species. For comparative purposes, crude protein requirements for the dog using purified ingredient diets (lactalbumin for protein) with 4.2 kcal of metabolic energy per gram are from 9.3 g per day BWKg075 (11.7% crude protein in an air-dry diet) to 14.0 g per day BWKg075 (15.0% crude protein in an air-dry diet). It has been demonstrated that an air-dry diet (3.5 to 4.0 kcal of metabolic energy per gram) providing 6.0% crude protein from casein will maintain nitrogen balance in the adult dog for a short time (Burns et al, 1982; NRC, 1985). It is emphasised that the protein sources used to develop these requirements for the dog are highly digestible and have a high biological value. Thus, they represent minimum requirements. Animals fed natural ingredient diets, with a lower digestibility and biological value, require higher protein intake levels to support metabolic needs. Dierenfeld (1997) has proposed that protein requirements of the giant panda are readily met by bamboo (average 9% crude protein on a dry-matter basis) based on intakes of 6 to 15% BW (fresh-weight basis). Having the greatest energy density among dietary fractions, fats are a concentrated source of calories. Fats also contain fatty acids, several of which cannot be synthesised from precursors by mammalian tissues (dietary essential fatty acids). Additionally, fat facilitates the absorption of fat-soluble vitamins (vitamins A, D, E and K). Bamboo, like other grasses, is typically low in fat. Dierenfeld (1997) proposed that dietary crude fat concentrations should be about 5% (dry-matter basis) for the captive giant panda. Additionally, this investigator proposed a minimum dietary concentration of 1% linoleic acid (C18:2 n-6; dry-matter basis). Studies of mineral and vitamin metabolism and utilisation in the giant panda are lacking. There are limited references identifying mineral concentrations in bamboo species consumed by giant pandas under field conditions (See Table 6A.2 in Appendix 6.A). Again, the rapid passage of food through the giant panda gut could impact mineral and fat-soluble vitamin requirements. Further, it is unknown if the rapid transit phenomenon is compensated for by increased food intake. Nonetheless, the concentrations offered in Table 6.A.1 in Appendix 6A (in conjunction with established requirements for the domestic dog) might serve as dietary guidelines until controlled studies are conducted. Despite the nearly obligatory relationship between the wild giant panda and the bamboo upon which it feeds, pandas in captivity have been offered, and consume, a diversity of foods. The rationale behind offering non-bamboo foods is unclear but may be related to reports that giant pandas in the wild opportunistically consume various items (Dierenfeld et al., 1982, 1995, Schaller et al., 1985). The exclusive use of food habits in the field for developing captive management schemes is problematic, largely because nutritional interactions within a natural ecosystem have not yet been characterised. It is clear, however, that consuming a novel food in a captive environment does not in itself imply nutritional adequacy of that food (Ullrey, 1989; Robbins, 1993). Furthermore, when formulating a dietary husbandry plan for a species it is essential to understand that the nutrients required in the diet can be derived from a broad range of ingredients. The giant panda adheres to this principle, although bamboo continues to be the single most important component of the diet in captivity. 17 to 82% of the offered diet (on an as-fed basis) (Dierenfeld et al., 1995). In the CBSG Biomedical Survey of giant panda diets at five Chinese facilities (from 1998 to 2000), the average proportion of bamboo in the offered diet was 72.1% of dry matter (46.3 to 91.6%; n = 22 animals). Bamboo contributed 53.3% of dietary dry matter (19 to 88%; n = 36) in these diets based on consumed amounts. Harvested bamboo should be presented to giant pandas in a manner that promotes acceptance, using storage and handling methods that minimise changes (e.g. desiccation) post harvest. These methods include multiple presentations of fresh bamboo, at least three times daily, with more frequent feedings in environments with elevated ambient temperatures. This strategy addresses the rapid desiccation of some bamboo species and also encourages extended bouts of feeding that are more typical of panda feeding behaviour in nature. Selection of bamboo species to be cultivated for an ex situ management programme may be influenced by availability and local growing conditions. Differences in nutrient composition among bamboo species have been described (Tables 6.A.1 and 6A.2 in Appendix 6A; Nickley, 2001; Tabet et al, 2004), and a range of species has been offered and accepted by giant pandas (see Table 6.6). However, too little research has focused on the nutritional benefits of utilising one species over another. Without these data, it seems intuitive to begin a programme by selecting bamboo species that are consumed by free-ranging animals. Additional species might be selected on the basis of similarities in nutrient content, taxonomic relationship or a geographic range that are compatible with the panda. For example, it would be more appropriate to utilise bamboos that grow in temperate rather than tropical regions. If non-bamboo foods are used as supplements, their effects on gastrointestinal function must be considered. Anecdotally (based on faecal characteristics), the giant panda in captivity has limited ability to use certain foods that would be considered quite digestible by other omnivores (e.g. bears and pigs). This constraint, combined with the lack of apparent digesta mixing in the intestinal tract, may contribute to gastrointestinal disease in captive giant pandas fed foods physically and nutritionally dissimilar to bamboo. Mainka et al. (1989) reported mucous stools and constipation in animals consuming diets containing less than 60% bamboo (dry-matter basis). Others have also described negative effects of limiting offered bamboo on faecal consistency and gastrointestinal health in this species (Goss, 1940; Nickley, 2001). Traditionally, diets fed giant pandas in captivity in China have included a high-starch bread or gruel. These foods serve as vehicles supplementing a variety of proteins, minerals and vitamins. Their composition, which sometimes constitutes the primary source of dietary calories, is widely variable amongst institutions (Dierenfeld et al., 1995). Ingredients used include a range of grains, grain by-products, legumes, milk, milk products, meat and eggs. Because of elevated concentrations of starch, sugars and other nonstructural carbohydrates, these items are significantly different in composition from bamboo. A high-fibre supplemental biscuit has been formulated to replace the traditional 'bread' offered to captive giant pandas in China (Edwards & Zhang, 1997). This supplemental food delivers amino acids, minerals and vitamins within a fibre matrix that mimics the structural carbohydrate content of bamboo leaves (21% NDF and 16% ADF on a dry-matter basis). Thus, these nutrients enter the gastrointestinal tract in a form that is less likely to result in excessively rapid fermentation, digestive upset, unsatisfactory faecal consistency and gastrointestinal disease. Body mass and body condition are important criteria for evaluating the nutritional and overall health status of an animal. A standardised body condition scoring system for objectively evaluating subcutaneous adipose tissue distribution and lean body mass has been developed for the giant panda (see Chapter 4). Interested readers should refer to this chapter for details about assessing body mass and condition, as well as understanding these findings associated with the CBSG Biomedical Survey. 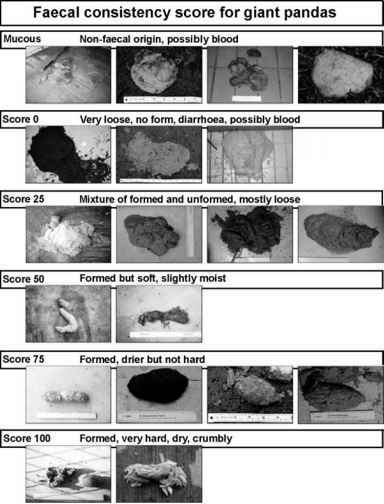 The appearance and 'quality' of giant panda faeces is influenced by differences in nutrient content, physical form of diet and the diversity of foods offered. Faecal consistency is important as it is often used as an indicator of food utilisation and gastrointestinal health. A standardised faecal grading system customised for the giant pandas has been used routinely to monitor and document faecal consistency, facilitate communication among animal care professionals and evaluate the relationship between dietary factors and faecal quality (Fig. 6.4; Plate VII) (Edwards & Nickley, 2000). percentage of total dry-matter intake) and faecal consistency has also been described in two giant pandas (Nickley, 2001). An animal consuming 53% bamboo (dry-matter basis) produced more faecal boluses (12.5% of total) of undesirable grade (0 to 25; see Fig. 6.4; Plate VII) than another animal consuming 70% bamboo (dry-matter basis) that produced only 0.6% faecal boluses of undesirable grade. Although free-ranging giant pandas excrete faecal boluses coated with a thin, protective layer of mucus, captive counterparts excrete variable quantities of mucus that are not associated with faeces. Panda caregivers commonly refer to these free boluses as 'mucous stools'. The production of mucous stools, unrelated to faecal material, has not been observed in the free-ranging giant panda (W. Pan, pers. comm.). The excretion frequency and volume of mucous stools in captive specimens vary across individuals, locations and seasons. A significant inverse relationship has been reported between the amount of bamboo consumed by a captive giant panda and the frequency of mucous stool excretion (Goss, 1940; Mainka et al., 1989). For example, a male giant panda that consumed 53% bamboo (dry-matter basis) produced 39 mucous stools over a 636-day period compared to a female at the same location who consumed 70% bamboo and produced six mucous stools over the same interval (Nickley, 2001). Giant panda life stages are generally categorised into four groups: neonates (0-365 days old); juveniles (12-18 months); subadults (19 months to 4.5 years); and adults (>4.5 years). Nutritional support of the neonatal giant panda has been addressed in detail by Edwards et al. (see Chapter 13). The teeth of neonates begin to erupt by the third month (Chorn & Hoffman, 1978), and young pandas in the wild may sample bamboo and other solid foods as early as five to six months of age (Schaller et al, 1985). Thereafter, there is a gradual transition from highly digestible mother's milk to the highly fibrous, poorly digestible diet of bamboo. Nonetheless, the juvenile giant panda is not nutritionally independent from its dam until about 18 to 24 months of age (Pan, 1988; Schaller, 1993; Zhu etal., 2001). When applying this information to captive giant panda management, it seems appropriate to allow cubs to remain with their mothers to as late as 24 months of age, even though the female may re-breed a few months before weaning. During this two-year interval, the cub becomes familiar with and starts to use the diet offered to its dam. Quantities of these foods can be increased as the cub's solids intake increases. If a management protocol requires removing an early stage cub from the dam, hand-rearing protocols and human-made milk formulae are available (see Chapter 13). Subadult age is a particularly vulnerable time for captive giant pandas (Liu et al., 2002). In one review of captive births over 30 years, only 18.2% of cubs (26 of 143 births) survived to three years of age and, of these, 79.8% of mortalities were associated with gastroenteritis and malnutrition (Feng et al., 1993). Inadequate nutritional support of cubs weaned from their mothers as early as four months of age no doubt contributed to this high death rate. Interestingly, little information is available on the growth and development of giant pandas that were exclusively mother reared. This is due, in part, to the common practices of early weaning as well as giving cubs that remain with their mother supplemental foods to promote rapid weight gains. Some investigators (Liu et al, 2002) have proposed that subadults that are 19 months to two years of age should gain 3 kg per month, whereas subadults of 2.1 to 3.9 years should gain 1 kg per month. It also was proposed that giant pandas four years of age or older should have no net weight gain. Given the advances in nutrition and health care, certainly the number of giant pandas reaching geriatric age will increase. Proper nutritional support for these individuals is an essential feature of responsible palliative care. Of particular concern is the impact of declining dental health on the ability to consume adequate long fibre in the form of bamboo (see Chapter 15), which, in turn, will result in abnormal faecal consistency. One potential solution to support normal gastrointestinal health in older animals may be the mechanical chopping of bamboo followed by mixing with other suitable foods. An example would be the use of a nutritionally balanced, commercially available, high-fibre extruded diet which would provide a stable source of nutrients and energy along with a pre-processed source of plant fibre.